Vintage - Wedgwood China's "The Etruria" Blue Laurel Pattern #WWETRB - Made in the 1940's - Total of (21) Pieces - Includes up to $20.00 Shipping Credit. 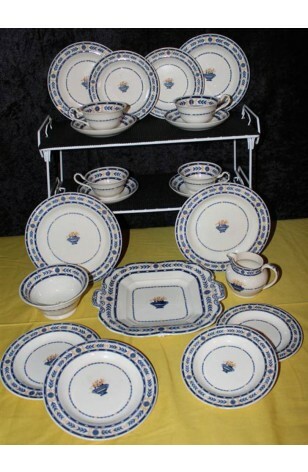 This beautiful China, in "The Etruria" Blue Laurel Pattern, is a Cream Ware Set with a great Blue and Yellow Pattern. A Blue URN filled with Yellow Flowers is in the Center of the Plates and Platter. All Pieces have a Blue and Yellow Verge, Blue and Yellow Banded Laurel with the Cups having Bands on the inside of each. Just a great Tea Set having (21) Pieces and a Full Service for Four. 4 - Bread/Dessert/Tea Plates - 6 1/8"
2 - Salad Plates - 7"
4 - Luncheon Plates - 8 1/4"